Figure 3. 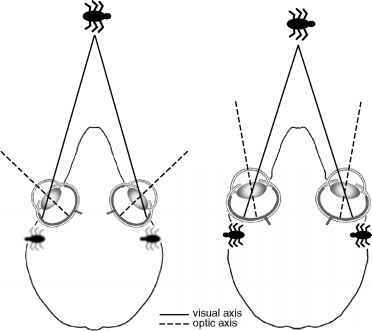 Diagrams illustrating hypothesized relationship between eye shape and activity pattern. N = nodal point. Distance from nodal point to retina is focal length. Visually dependent diurnal animals are expected to have large focal lengths relative to pupil diameter in order to maximize image size and, hence, the resolution of the image (A). Visually dependent nocturnal animals are expected to have large pupil diameters relative to focal length in order to maximize image brightness (B). Nocturnal animals can also increase image brightness by increasing eye size while also increasing the effective size of the photoreceptor units (Land and Nilsson, 2002). Figure 4. Diagram illustrating measures of eye shape used in this study and the variables they estimate. 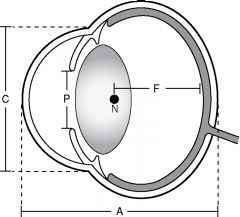 N = Nodal point; F = Focal length or posterior nodal distance; P = Pupil diameter; C = Cornea diameter; A=Axial diameter or length of the eye. 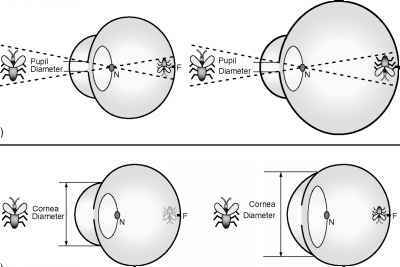 Cornea diameter is a reasonable estimator of pupil diameter (see Ross, 2000). Axial diameter of the eye is assumed to be a sufficiently good estimator of focal length of the eye, following Hughes (1977). nocturnal animals are predicted to have large corneas relative to their focal length regardless of body or eye size (Figure 3B). In addition to these effects on eye shape, nocturnality is also predicted to be associated with increased eye size. The pupil obviously cannot be larger than the eye, so eye size limits the amount that the pupil can be expanded. If pupil diameter is increased by making the eye bigger, focal length will also increase, reducing image brightness by decreasing the angle of acceptance of the photoreceptors. However, this latter effect can be compensated for by increasing the effective size of the photoreceptors. In vertebrates this is done by pooling many receptors into one functional unit by connecting many of them up to a single ganglion cell—a phenomenon widespread among vertebrates, including primates (Kay and Kirk, 2000; Rohen and Castenholtz, 1967). Thus, photoreceptor pooling allows image brightness to be increased purely by increasing eye size, so it is expected that nocturnal animals will have larger eyes than similarly sized diurnal animals. It has also been argued that photoreceptor pooling has the added benefit of widening the range of "image brightness," or luminance, to which an animal is sensitive (Martin, 1999). This hypothesis assumes that the size of the photoreceptor (rod) pools of nocturnal animals is flexible at the retinal level, allowing changes in the size of the pool in response to different luminance levels. This would be valuable in nocturnal environments that are characterized by a much wider range of luminance levels than diurnal environments (Lythgoe, 1979; Martin, 1990, 1999). The hypothesis argues that increases in eye size would augment the number of photoreceptor pools, creating the possibility of greater flexibility to the greater range of light levels in nocturnal environments (Martin, 1990, 1999). The validity of this hypothesis remains in doubt until mechanisms for adjusting receptive field size in sco-topic conditions are demonstrated. Primates lack rod-rod coupling that might be one mechanism to accomplish this (Djamgoz et al., 1999), but there do appear to be up to three pathways for information to pass from rods to the inner retina, and these pathways may operate under different ambient light conditions (Bloomfield and Dacheux, 2001). Diurnal animals, in contrast, are not constrained by the need to shorten focal length or enlarge the pupil, because image brightness is not a problem in the photopic or light rich environment. Consequently, visually dependent diurnal animals are able to have long focal lengths, thereby decreasing the acceptance angle of each photoreceptor in the retina and increasing visual resolution (Figure 3A). Another way of saying this is that increased focal length spreads the image over a larger number of photoreceptors, increasing visual resolution. Moreover, because diurnal animals do not need to enhance image brightness, they are predicted to have small pupils relative to focal length. What is Posterior nodal distance?